Dr. Tracey Rickards will be working to improve the care of vulnerable populations in Fredericton, thanks to a major grant from the Canadian Institutes of Health Research (CIHR) and the New Brunswick Health Research Foundation (NBHRF). Dr. Rickards, an assistant professor with UNB’s faculty of nursing, was recently named a recipient of an Embedded Clinician Researcher Salary Award. 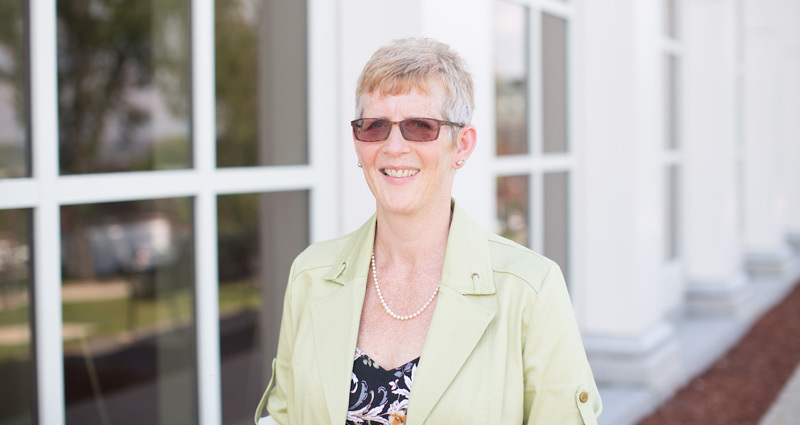 She is one of only two Maritime recipients of the prestigious grant, which will allow her to work directly with the Fredericton Downtown Community Health Centre (FDCHC), performing multi-disciplinary research and mentoring enthusiasm to build a team of clinician researchers. Dr. Rickards’ ultimate goal is to leverage the hands on knowledge of those working on the frontlines at the Downtown Community Health Centre to seal the cracks in the system for vulnerable populations. As the grant name implies, Dr. Rickards will be embedded at the health centre where she will be an active member of the interdisciplinary team of health care providers. In addition to conducting research, she’ll also have the opportunity to provide services and talk directly to clients about care. A large part of the four-year project will focus on determinants of health, such as poverty and education. For example, one of the questions the project will ask is whether adequate housing increases stability in health status for vulnerable populations. “If we’ve got people in stable housing who suddenly see their diabetes under better control or whose ulcers are not coming back, it provides the basis for us to argue that if you want to decrease the cost of the health care system, you can spend a little bit of money upfront on housing and see it go a long way to decreasing the cost of health care,” Dr. Rickards said. The Fredericton Downtown Community Health Centre is a partnership between UNB’s faculty of nursing and Horizon Health Network. Together they have created a teaching facility that delivers an integrated program where primary health care services including outreach services, teaching and research are combined to vulnerable populations including the poor, homeless, refugees and persons without a family physician or nurse practitioner. Dr. Rickards will also focus her research on the impact of outreach care and the introduction of nurse practitioners to New Brunswick’s health care system. In the 15 years since the Nurses Act was amended to enable their practice, no formal evaluation of their services has occurred. She hopes that this experience will provide a solid argument for a permanent research position at the clinic. The Embedded Clinician Researcher Salary Award has a value of $75,000 per year for four years and is accompanied by a partner contribution of $25,000 per year for four years from the New Brunswick Health Research Foundation.